Baron Vision Center in Decatur Indiana is one of the most respected eye healthcare practices in the area serving northeast Indiana and northwest Ohio. 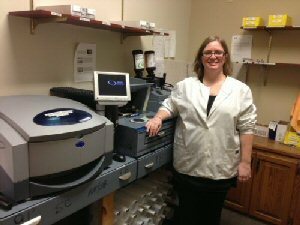 Adding the Q-2100 Digital Lens Technology to their practice in 2008, Anna Fosnaugh has been the primary manager of the in house optical lab since 2009. Anna shares the following about her experience with the technology, “I love that the software is incredibly user friendly…my first day back in the lab it was like riding a bike, I just slipped right back into the routine and realized I hadn’t forgotten a single thing.” I also love the clarity that the material and AR coating provides,” Anna added.